We've mentioned in previous posts how proud we are to host a full 365 days of activities and programming. The winter is no exception. You've all been asking, so we're pleased to announce that the beloved ice skating rink and holiday shops will return to the park. This winter season, we are excited to partner with our neighbor Bank of America. The Bank of America Winter Village will feature all the same amenities you love, but with a spiffy new look and exciting upgrades. Stay tuned for more details about the ice rink and holiday market! The Bank of America sponsorship of the Winter Villages deepens its commitment to the Bryant Park neighborhood. The bank's headquarters overlook the park, and their support of the Film Festival and Broadway in Bryant Park series this summer guaranteed the success of both programs. The Winter Village will open in less than a month on November 1, and continue until March 2. In keeping with tradition, the skating rink will be Manhattan's only rink with free admission. Boo. I'm fine with the rink and shops, but it's opened so early the lawn gets snatched away from us for some of the nicest days of the year as the rink stuff is "loaded in." When is the lawn going to be closed? Hello, we hear you! We try to minimize the amount of time that the project takes to load in as much as possible. Today will be the last day of the lawn for the season, and the removal process will begin tomorrow to make way for winter. You guys do an amazing job at putting things up and taking them down!!! I work across the street on the 37th floor and am always supervising the work with my colleagues...it's a nice thing to watch when you need a break from the computer!!! I hope B of A would do a much better job with he staff at the rink and the Winter Village. The past couple of years, the ice skating rink have been staffed by uneducated and rude workers who probably got rejected working at a fast food chain, treated the visitors and customers with such disrespect and like cattle, esp the guards controlling the line/crowd outside, the cashiers, the ring attendants (oh boy, were they conceited and not helpful when one wipes out, blaming or telling someone that they should not ice skate if they don't know how), and the zamboni driver (he acts like he's god of the ice skating rink). Holidays are supposed to be festive. Train and or hire your staff well. Thanks You. End rant. Is there going to be a construction going on this Saturday (19th)? 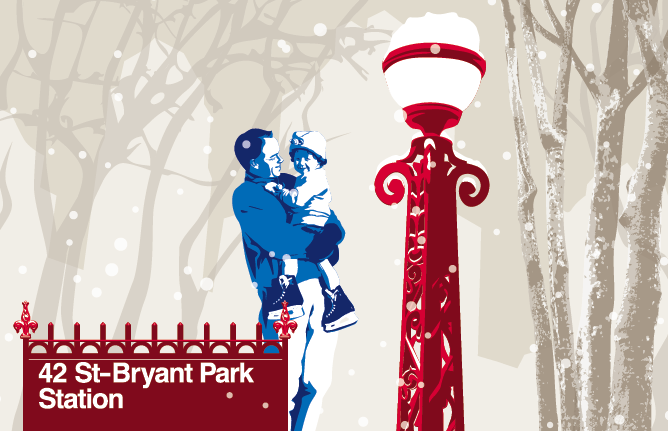 Will the east side of the park be closed, near Bryant's statue?